"I think I'm bringing only one pair of jeans," he says as he picks up the cumbersome suitcase to judge whether or not it exceeds fifty pounds with the inaccurate scale of his biceps. I wonder what do you pack when you are going to Kenya, the horn of Africa, neighbor to the desperate Somalia that's been in the news. What can you possibly put in a suitcase that can make a difference in a place where famine is rampant, and HIV/AIDS is indiscriminate, there is corruption, and some children don't even have shoes between the soles of their feet and the dust of the Earth. There's already been many vaccinations against yellow fever, typhoid and rabies. There's been prayer and tears, and new friendships with others who also pack and go. There's a renewed friendship with Wesley, and a coming together as one to go ye, therefore, into all the world, and preach my gospel to every creature. There are plans and prayers and hope tucked in his suitcase, and how much do they weigh? For all I know, they lighten the load and give love wings to fly. There've been things unpacked in preparation as well. The bibles seem more like journals now because they are a record of his life. Since the days of Mike's cancer, he has systematically worn out three with the living of eight years. Each testifies to how a life devoted is lived between its pages, its lines, and words. This is what a bible looks like when a laid-down life intertwines with the Word. It bursts the bindings and pages let loose. It's always Revelation that escapes, the future hope that refuses to stay pinned down. It wants to flutter away, a note of good news that's been pollinated with devotion and looks for new ground in which to germinate. Mike searches those pages and finds old outlines, sermon notes, and his documented life there. He remembers hovering fragile at death's door. He remembers clinging to hope when there was nothing else to cling to and energy for little else anyway. There are oily pages that soaked up the oil from anointed cloths that had hands touch it and prayers breathed over it from pastors too far away who couldn't come lay hands on Mike and pray for him. But their anointing oil touched his live in these pages anyway. Those oily pages whisper now, "Go, touch, be there, don't send a cloth substitute if you don't have to." This is what you pack in an American suitcase to bring to a third world country that is desperate and poor, sick and dying, in need of hope and good news. You pack your own story intertwined with His that is bursting at the seams to be told. You go and tell of being desperate and in need yourself, you walk as living proof that the sick and dying can live, and you deliver hope and good news just in the going. God may not fit in a suitcase, but a testimony and the gospel are all the better when delivered in one. 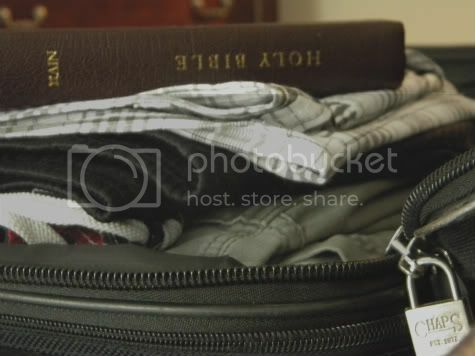 The body of Christ squeezes into a suitcase because hope and love and salvation are transportable. This post was featured in the High Calling Community.